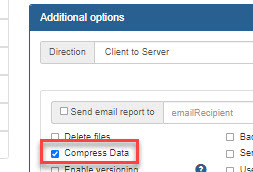 Questions: What does the Compress Data (see image below) option do when using Syncrify? Answer: Syncrify tries to compress data during the backup process when this option is checked. It compresses a chunk of file, sends it over the server and finally, the server decompresses it before saving it to the disk. This compression is only meant to speed up the data transfer. Once the file is on the other side, it regains its original form. Can the files be compressed on the server to save disk space? Server side - Use the compressions provided by the OS to compress the repository folder. Using compression at the OS level drastically reduces scalability and therefore, is not recommended if you expect a high volume.